Every day a good book comes into the world is a day to rejoice. But today, the launch of the debut picture book by our very own Tameka Fryer Brown, makes it even more sweet. 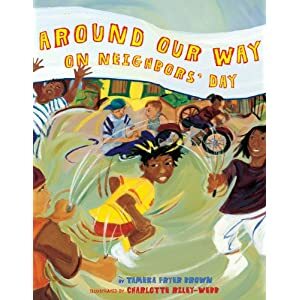 Around Our Way on Neighbors’ Day (Abrams, 2010), illustrated by Charlotte Riley-Webb, is a celebration of a girl’s love for her multicultural community. It’s already winning acclaim. Check out the kudos below and tell a friend. You can read Tameka’s Writers Against Racism (WAR) interview featured on Bowllan’s Blog here. Check out her post on Ripples from the Tide Pool here. You can fan Tameka on FaceBook here. Congratulations Tameka! This book sounds so energetic. I love the cover — all that swirling activity — and I love the idea of a block party. This looks beautiful. Yay for you! It’s here! It’s here! Many congratulations, Tameka. Such a warm, lively book. Thanks for the support, BrownGirl and Gbemi! How exciting! I’m going to buy a copy for my god-daughters and then a copy for my local library. Pingback: Picture Book Review: AROUND OUR WAY, by Tameka Fryer Brown; Illus. by Charlotte Riley-Webb « Multiculturalism Rocks!